Want your business featured at Wedding Slideshow Ideas? It’s one of the best ways to build credibility and get extra online exposure for your company! When you become a Featured Partner, we’ll include photos you provide to us in your own custom interface on our Quickstart Slideshow Creator. What is the Quickstart Slideshow Creator? The Quickstart Slideshow Creator is a feature we have on this site where we pre-load photos to our online slideshow service. Quickstart allows your clients to easily create a free 30 second slideshow with pre-loaded images provided by you. Your clients who will most likely be first time users will have to create a free account or login with their Facebook account before they can make a slideshow. Once logged in, users just have to click the “Create Slideshow” button and they’ll be emailed as soon as the slideshow has been created. The rendering process only takes a few minutes to complete. What Do Our Partners Get In Return? As a featured partner, you can send your clients directly to our Quickstart Slideshow Creator and have your clients create a dynamic slideshow with your photos! We will also add your logo (if you provide one) to the end of the slideshow to brand your company. The video that is emailed to your clients can be used as a marketing tool and is easily sharable with others. It can also be embedded on a website, shared on Facebook, Twitter, etc. An unlimited number of users can create a slideshow customized with your images. Each video slideshow will be unique looking. We will also give you a web badge that you can embed on your site acknowledging that you are one of our featured photographers. 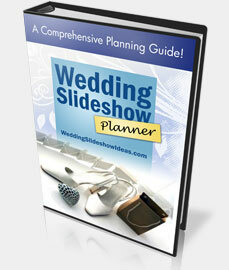 Partners also get a Featured Article about their company on this site – Wedding Slideshow Ideas. You need to provide us with a write-up of at least 500 words about your business that we will need to approve and possibly edit. We’ll also add a post about you on our Facebook page. You do not have to be a wedding photographer or videographer to be featured. If you work in the wedding industry and have photos related to your business, you’re good to go! For example, if you create beautiful wedding favors and have photos, you can be a Featured Partner! What Does The Slideshow Interface Look Like? Click the button below and you’ll be taken to the slideshow editor for Wedding Slideshow Ideas that contains our pre-loaded images. Once logged in, notice that the yellow banner at the top can be customized with your company name. If you’re new, you’ll need to create a free account or login with Facebook. Please note that our Partner Program is not available yet. Please check back soon!